Apollo’s Hegemony Brain Fuel™ v2 is a dietary supplement containing a unique composition of agents that stimulate the activity of the brain. It helps to achieve clarity of mind quickly and gain energy to undertake a task, thanks to which any intellectual activity becomes much more effective. Caffeine – the main representative of purine alkaloids, the most popular nootropic substance in the world. Its energising properties were used by humans as early as in prehistoric times, and because of its prevalence, it became an element of cultures of many societies around the entire world. The mechanism of its activity is quite complex, and the most interesting property seems to be the interaction with adenosine receptors. Adenosine is a neurotransmitter that inhibits the activity of the nervous system, so its main effect is the feeling of tiredness. As it turns out, the structure of a caffeine molecule is able to bind with adenosine receptors but without inducing the chain of reactions typical of the neurotransmitter, so it constitutes its competitor and blocks its activity. The mechanism lies at the very base of caffeine’s activity, that is reducing sleepiness and the feeling of tiredness, which makes it particularly desirable for sports lovers. Apart from inhibiting tiredness, caffeine is also a typical stimulant. Its ability to stimulate the nervous system stems from increasing the concentration of noradrenaline and dopamine in synaptic gaps, thanks to which we experience a boost of energy, alertness, motivation, and an improvement of concentration. To a lesser extent, caffeine also increases the concentration of acetylcholine and serotonin, which fantastically complements the entirety of its activity. N-Acetyl L-tyrosine (NALT) – an acetylated form of the amino acid constituting a structural element for catecholamines, that is dopamine and noradrenaline. It is much more assimilable in that form than traditional free L-tyrosine. By increasing the concentration of those neurotransmitters, it helps to increase energy and concentration, that way complementing the activity of caffeine. It also supplements substrates necessary for rebuilding the neurotransmitters that were released by caffeine from nerve endings, thanks to which it can reduce the energy drop that some people experience after the alkaloid stops working. Below are presented much less popular substances with very high nootropic potential. 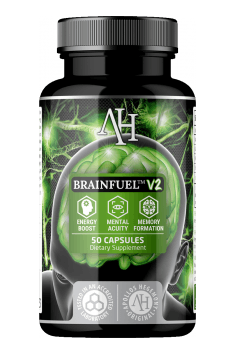 They constitute the pillar of Brain Fuel™ v2’s activity, increasing cognitive functions in an innovative way. Sunifiram (DM-235) – a hypermnesic (memory-enhancing) substance made on the basis of piracetam, much more powerful than its “ancestor”. Despite being a piracetam derivative, it does not belong to the family of racetams, as the periodicity of pyrrolidone in its structure is broken. It exhibits procognitive properties despite the lack of affinity with any of the receptors and ion channels tested. However, it is suggested that its ability to enhance memory stems from its ability to activate indirectly AMPA receptors of the glutamatergic system, because of which sunifiram is considered an ampakine. It also has some effect (also indirect) on the activity of another glutamate receptor, NMDA-R. Glutamate is a strictly brain-stimulating neurotransmitter. By affecting the place of glycine attachment in NMDA receptors, it can also help to stimulate the long-term potentiation (LTP) and the phosphorylation of proteins CAMKII and PKCα, which is believed to be the mechanism responsible for direct AMPA receptor activation. The mechanism is similar to that of another nootropic, nefiracetam. As if that was not enough, research suggests that the release of acetylcholine in the brain is much higher because of sunifiram, especially in the prefrontal cortex. Acetylcholine is known for its ability to enhance memory and logical analysis capabilities. The prefrontal cortex is the area of the brain responsible for working memory and its higher functions, such as decision making, social consciousness, organising, planning, or data analysis. Coluracetam (MKC-231) – a substance of the group of racetams, characterised by slightly different activity than that of typical representatives of the group, such as piracetam. The compound was primarily tested in terms of Alzheimer’s disease treatment. The main mechanism of activity of the agent is stimulating the activity of high-affinity choline uptake (HACU), that is enhancing the process of its uptake by neurons, which results in greater amounts of the substrate of acetylcholine formation. HACU is sometimes referred to as the bottleneck in the process of acetylcholine production, and its stimulation makes it possible to bypass the natural limits and produce the neurotransmitter more efficiently. Coluracetam can also increase the release of acetylcholine to synaptic gaps, especially in the hippocampus, which is the area responsible for long-term memory. The chemical compound also exhibits neuroprotective properties, protecting neurons from the cytotoxic activity of excess glutamate. Similarly to the main racetams, it also affects the activity of AMPA receptors, which increases the efficiency of remembering. Its unique property, on the other hand, is its ability to improve the mood. Clinical tests have shown that some patients experience an improvement of the symptoms of depression and anxiety disorders even if previous antidepressant treatment brought no results. At the same time, no toxic effects have been observed despite the use of high doses. With this agent, information will be saved in your brain much more efficiently. The composition of Brain Fuel™ v2 was designed so as to achieve maximum effects thanks to the synergic activity of its elements. When it comes to forming memory, sunifiram and coluracetam cooperate very well, as both of them affect the activity of AMPA receptors. The stimulation of the long-term potentiation induced by those components translates into stronger signals transmitted between neurons thanks to changes in the structure of presynaptic and postsynaptic membranes. It is the mechanism lying at the very base of learning which makes it possible to remember and recall information more efficiently. Synergy is also visible in the cholinergic effects of the product, as coluracetam improves choline uptakes for neurons. Choline is then converted to acetylcholine, which is later released to synaptic gaps in the prefrontal cortex thanks to sunifiram and in the hippocampus thanks to coluracetam. Because of that, the ability to plan, organise and consolidate information is significantly improved. If you lack energy, motivation and struggle with a bad mood, Brain Fuel™ v2 can be a perfect supplement for you. Energy and motivation are affected practically by every component in the complex thanks to the simultaneous production and release of dopamine and the activation of glutamate receptors. Caffeine was used in a moderate amount that should not cause any effects in the form of irritability and increased anxiety that often accompany its greater amounts, which is further reduced by the presence of coluracetam. What you experience then is the pure energy-boosting and motivation-increasing activity of caffeine, complemented by tyrosine. Some users of coluracetam have reported some interesting effects on sensory reception, that is increased visual perception and more intense auditory experience. To sum up, Apollo’s Hegemony Brain Fuel™ v2 is a top-quality complex nootropic agent. It increases the cognitive functions of the brain in a unique way, efficiently accelerating learning and inducing a significant boost in the mood and energy levels. Nigdy nie jadłem nic równie dobrego - mega środek! Brain Fuel v2 50 caps. Take 1 capsule a half hour before increased mental activity. Do not use more than 2 capsules per day. Brain Fuel™ v2 can significantly improve the efficiency of learning. It is recommended to take one capsule about 30 minutes before an anticipated intellectual effort. It proves particularly helpful in situations when you need maximum concentration to remember a lot of information. More demanding users can use another capsule later during the day but it is not recommended to take the supplement later than 4 hours before sleep, as it can make it more difficult to fall asleep. Two capsules taken at once are an option for people resistant to the activity of stimulants; however, it is not advised to take a double portion without trying the one-capsule dosage first. The supplement proves particularly helpful if used in need; however, there are no contraindications for taking it every day in times of increased intellectual activity, for example in an exam session.